"This is babylon station, a station for reggae, dub and dancehall beating as one. We have a 5 minute stop"
BABYLON STATION is musically a definitely different band - a clash of a wonderful six-headed reggae team with religious riddim spirits into driven dancehall fun and a caleidoscope world of fabulous dubs. 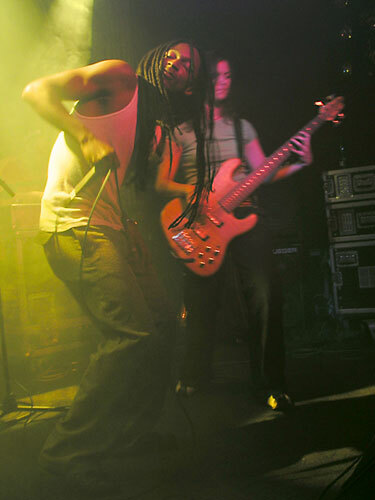 They are living offside from bigger reggae, dub and dancehall communities in Karlovy Vary (Karlsbad) in the Czech republic. For my opinion, no other act in the world keeps so close to a triangle mid of traditional reggae, modern dancehall and timeless dub. Dub-O-Rama: Hello SYNCRO, tell us about the circumstances who led to found your band. Syncro: Hello Bernhard, peace be with you and with the readers of Dub-O-Rama site. BABYLON STATION band is an evolution of my one man project called SYNCROSPACE. I have started with acid and trance back in the year 1993. As I've got deeper into the electronic music I have realised that I’m really interested in bass heavy music and melodic basslines. 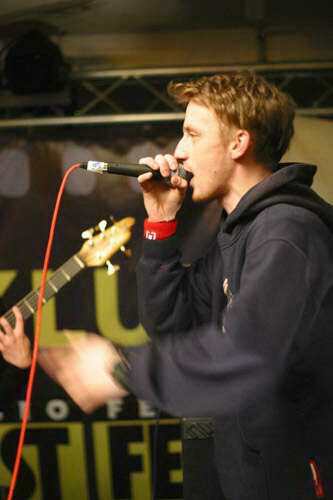 Then I have discovered the dub music and immediately started to listen to the tracks coming from the UK scene. It was the great time of steppers and electronic dub which was something completely new for me. I have moved from dance electronic to dub influenced ambient music and started a new project called RASTASKINS in 1998. Once I asked my friend to come to play a guitar solo to one of the new tracks and we both enjoyed the vibe of the session. He told me about a girl playing bass who should come to a rehearsal. We have jammed a bit and it was really uplifting. That was the birth of the RASTASKINS band. JANA, the bassplayer, invited her friend, female singer with very smooth voice, who added some vocals to our music. We changed our name to BABYLON STATION and started to play something between ambient and dub. It was year 2000. Then more members joined in, one of them was MARTIN, our sound engineer. Dub-O-Rama: And when did the band start really? As we went into direction to more dubwise and reggae sounding riddims, some original members didn’t want to follow it and we had come to split. It looked like the end of the band, but me, JANA and MARTIN realised that we want to continue the thing and we had found a common opinion in what to do. We didn't want to impress masses, didn’t want to see ourselves in the mags, etc. We just wanted to do our music to satisfy our inner motivation. 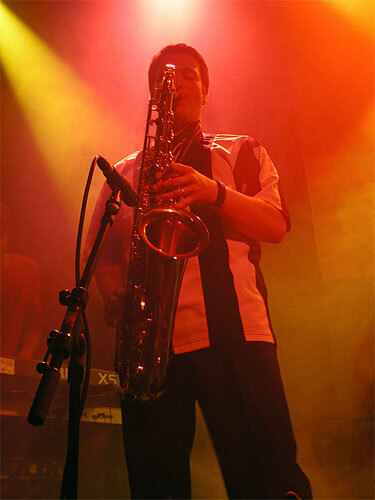 Therefore we started to look for some similar oriented musicians and brought BABYLON STATION into the next stage. It was 2003 and we still continue in present days. Today we are a bunch of friends who are just having a good time together, keeping a good vibe and doing our music with conscious purpose. Dub-O-Rama: You tell us on your site, you have a "straight message deeply inspired by Rastafari and Orthodox Christian Church!" I can´t really believe this, because I feel so much happyness and tolerance spreading all over in your music! Religion, well, but the main theme? Syncro: It's all about the idea of 'One Love'. I’m not an orthodox rasta because I'm not a black sufferer in the Jamaican ghetto. I’m not in need to repatriate to Africa, because I'm at home where I am. But I really like the idea of pure consciousness, unity, equality of people, etc. I think about the Rasta ideas as the metaphors, symbols. As for Orthodox church, I'm half Russian and half Czech, therefore I have my sympathies for the Orthodox christianitz. I’m not an active member and there are a lot of things I personally don't like about the organised church itself, but I like the message of humanity in the christianity. It's hard to sum it up in a few words, but all in all it’s a strong inspiration for me and my friends. We try to fight "Babylon" with our music, with our behaviour, with our way of life. Solidarity is just a consequence of this idea that we all are one people and we all deserve to be treated like a miracle of Creation, like children of the 'Most High'. It doesn’t matter if you call him Jah, Allah or any other name. What does matter is if you believe that there is something what's beyond our world, something what is the last instance, the essence of all things and all the flowers, animals and people. If you believe in this, you simply have to act conscious. Dub-O-Rama: You are a six-headed band, working with international guest singers. What´s about the unity and the differences in the band? Syncro: In fact it's simple, we all are good friends. The core of the band is JANA, MARTIN and me. Then there are JIRI, LUKAS and SWAGR helping us to perform live with their instruments. They are not so much involved in the production phase, but they are a great help in playing the ideas live. Yes, we have guests, mainly on vocals, although we are very happy when anyone who feels it plays with us. As for the vocals, we have had a great time when EMSA toured with us and spiced our music with some hiphop flavour, we liked the vibe of JUAKALI on the microphone and we were very pleased to cooperate with other international singers on our records. It's always very interesting for us to join our vibes with someone else, because different people from different cultures have so much common that it’s really unbelievable. And the music itself is the uniting language. Dub-O-Rama: I am very impressed of JANAs bassplay. She keeps the mid of the band, the pulsing heart. Syncro: Exactly. I'm really happy that I can work together with her. 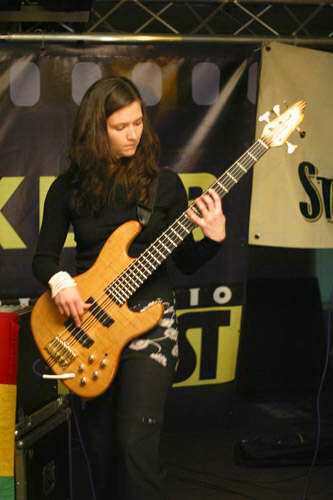 She's not just a bassplayer, she is one of the key persons in BABYLON STATION. When we started to do some things together, she was a young girl just learning how to play. But she very quickly realised what kind of freedom a bassist can find in dub. It's maybe the only style of music where the bass is the main instrument. Dub-O-Rama: Sometimes you are called as 'commandante'! What's to tell about it? Syncro: It's just an old internal joke. As I am the head of the band and sometimes I had to make a not so popular decision, our former keyboard player JENIK brought this nickname and I've quite adopted it. 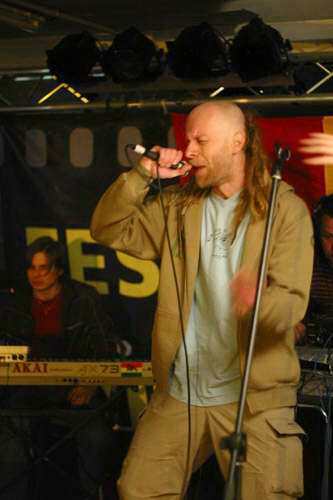 Dub-O-Rama: You have a friendship with the more well known Czech band HYPNOTIX. Syncro: They were the first Czech dub band who had some impact to the dub scene across the border. I have always respected them and their music. Even when they have moved to ethno trance, they are still a very interesting band. When we wanted to record our first songs, we didn’t have a suitable studio then. Therefore we asked them to record it in their studio and it became a great time spent together. 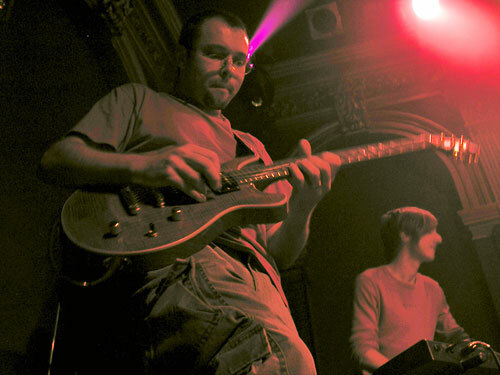 I personally like them all and especially their former guitarplayer PETR, who sometimes plays with us now. Dub-O-Rama: You have brillant guest singers. How about to integrate them into your band? Syncro: It's not really easy, because we are located in the small town in Czech Republic, you know. When you want to feel someone like a band member, you have to spend a lot of time with him in everyday life and it's simply not possible with peoples from other countries. But we have started a close cooperation with JUAKALI, a reggae singer from Trinidad & Tobago living in the USA. He visited us this year for two weeks. We did some rehearsals, recordings and played a concert which was so nice for all of us that we decided to plan a small tour together in June and July 2006. Dub-O-Rama: What is the thought and the background about releasing two singles at one time now?" Syncro: We spent a lot of time with MARTIN and JANA discussing how this production should be. We do admire the way how the Jamaican producers operate, they make a lot of good production with very limited resources. Riddim productions are essential part of this strategy. You have one instrumental, but different vocalists add different flavours to it. Each song is unique, although they have the common base. Selector can mix it together like one song, like a combination thing and make a lot of nice effects juggling with two or more plates on one riddim. I personally like this style. Both A sides of our singles are unique and they are very different in approach. LUTAN FYAH did a great job, I'm a big fan of him and I was really happy to make this thing. His song is really rough and it creates that certain type of pressure I love. JUAKALI is more calm, although his lyrics are very sharp. He has something in the voice what makes me listen closely to each and every word he says. Together it´s like two sides of the coin, both very important for us. Dub-O-Rama: Brillant singles, very well. When can we expect a longplayer of you? Syncro: It's like we had prepared the LP some one year ago, but as it took some time to complete it, we have decided not to release it as we weren't sure about the songs anymore. Probably it's not the right time to do it now and we have to wait till we collect enough material which cope with our expectations. I personally think that the reggae culture is a singles thing. When I select in a soundsystem, I play just singles, no albums. I buy longplayers from jazz bands, ethno or some experimental things, but I do have very little lps with reggae. I prefer to listen to mixtapes or even riddim LPs, but there are very few longplayers I listen continually from the beginning to the end in dub and reggae. Thank you for your interest in our band. I wish you and your readers many nice moments when enjoying the dub and reggae music. Blessings, Syncro.